Instagram is now offering user profiles that are viewable on your computer and they look very Facebook-like. But the service is still focusing on mobile. 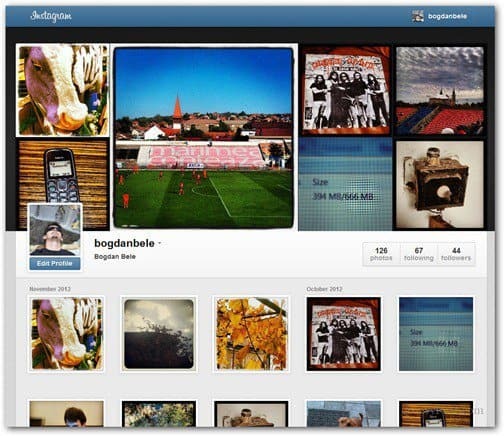 Instagram is now offering user profiles that you can view on your computer, and they’re looking very Facebook-like. This doesn’t mean the service isn’t focusing on mobile anymore though. Probably noticing that external services are already doing what the Facebook-owned company should have done, Instagram has announced it would offer user profiles. Using these couldn’t be easier. You just type instagram.com/useraccount (where “useraccount” is replaced by the name of your account). Unless the photos are set to private, you can view other user’s profiles without logging in. You can also add comments and like images straight from the web. But according to the Instagram blog, there’s still no ability to upload images from the web. The company says it wants to keep the service focused on production of content from mobile devices. It could be even better if it showed you your photo stream. But that feature would put Facebook in the position of competing with itself, so I don’t expect to see it soon.